Happy Halloween! It's the first holiday of the "Holiday Season" at Lil Raisin Acres! 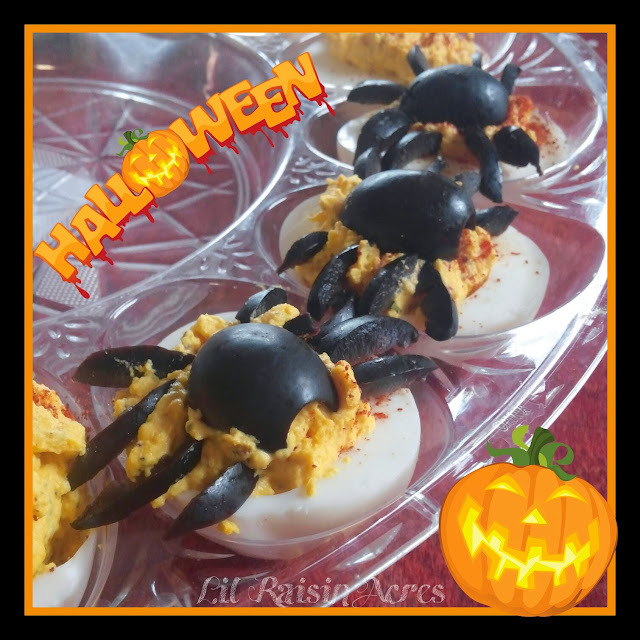 I'd been seeing these Spider Deviled Eggs around Pinterest since autumn. I finally had an excuse to make them. Here's the original idea that I had pinned last fall: PINTEREST. I think mine are a little more "rustic" looking... I used my own recipe for the filling, which can be found HERE on the blog. I forgot to grab relish at the store, so I had to substitute the relish for dill weed! Unfortunately it's pretty cold and damp out today, but it never stopped us as kids! There's even a possibility of flurries overnight, although I'll believe it when I see it. As long as the kids stay safe and have a good time, that's what's most important! No need to waste your pumpkin innards! 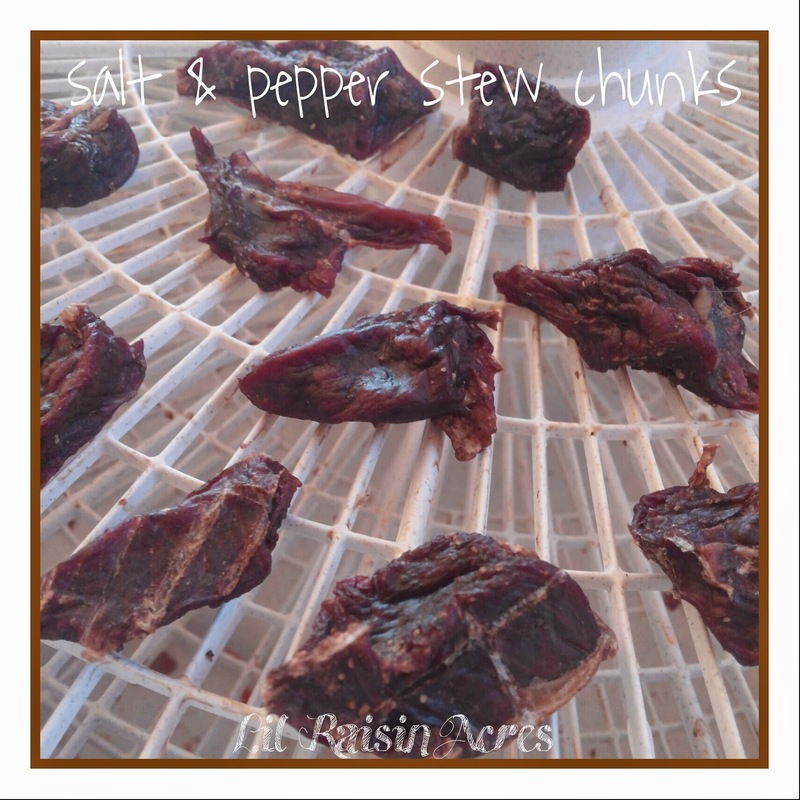 Throw the pulp to the wildlife and birds, and dehydrate the seeds for a healthy, tasty treat! 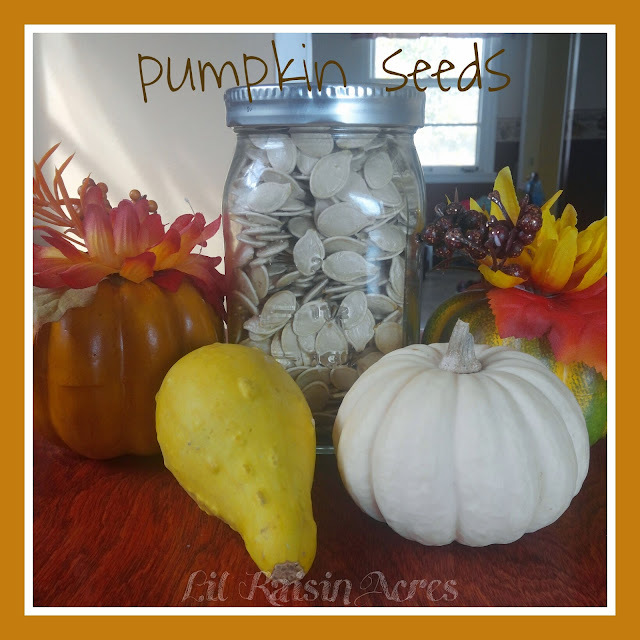 Making salted pumpkin seeds is surprisingly simple! Rinse seeds in a colander, removing any remaining pulp. Pour seeds in a bowl and cover with enough warm water that they float. Add 1 tsp. sea salt to the water. Soak seeds overnight at room temperature. In the morning, strain off water with a colander, shake off excess water. Allow to drain briefly, and return the seeds to the bowl. Add 1 tsp. olive oil and 1 tsp. sea salt, toss until seeds are evenly coated. 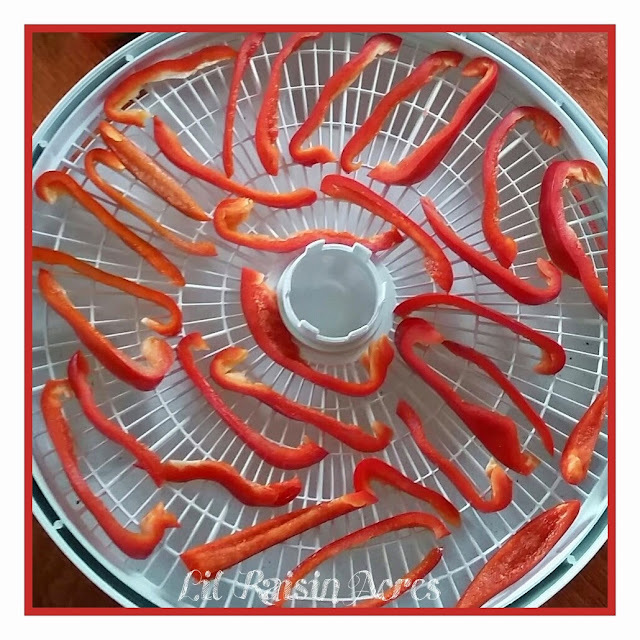 Place seeds on mesh screens in your dehydrator. You may sprinkle with additional salt, if desired. Dry on 115 degrees for appx. 8 hours. You may get papery, transparent membranes off some of the seeds. You can either brush those off or eat them. Store in an airtight jar or ziplock baggie. Sweet Peppers are a fairly common ingredient, found in cuisines across the globe. Unfortunately, they are quite expensive in the off-season. Preserve your harvest efficiently by dehydration! Cooking with your dehydrated peppers is easy as well. If you're making sauce or chili, simply add them as is to the pot (if you are using slices, crush them first). They will rehydrate during the cooking process. If you'd like to use them on pizza or in salads, soak in lukewarm water for 20 minutes before adding them to your recipe. Personally, I prefer slices, as it's more time efficient, and can be easily crushed before use. If you are dehydrating for pizza topping or in pasta salads, I'd recommend dices for presentation.